I am delighted to announce the first event that I am hosting in my space. 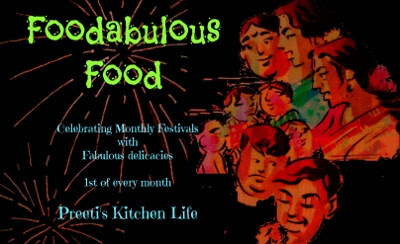 First of all, I would like to thank Preeti from Simply Tadka for giving this opportunity to host the Monthly Food Event & Giveaway, “Foodabulous Fest –April Month Series”. Inviting one and all to participate actively in this event and make this a huge success. It’s a monthly series which celebrate every month with monthly festivals and special days.. As a part of festive event… there will be a surprise cookbook sponsored by Simply Tadka.The giveaway is only for followers of Preeti’s blog and Facebook Fans.A random recipe will be chosen to win the Giveaway. This giveaway is open to all. 1. The event runs through the month of April (1st Apr – 30th Apr). 4. You have to follow Simply TADKA via GFC and Facebook. 5. No archives please, only fresh entries can add during the month of April. 6.Usage of logo and post must to be linked with Foodabulous Fest Event organised by Simply TADKA and hosted by Pramitha love cooking, it’s compulsory. 7. In case you have a problem using linky tool you can send the details to pramitha.prami@gmail.com in the following format using subject line of Foodabulous Fest- Celebrate “April Series”. For the Non-Blogger: you can send the recipe with details and pictures to pramitha.prami@gmail.com in the following format using subject line of Foodabulous Fest- Celebrate “April Series”. I will post the round up within ten days after the event gets over. The giveaway is only for who have Indian shipping detail. hey, any cuisine and vegetarian recipes allowed? or limited to indian only? You can post any type of cuisine,but veg only..eggs allowed. Hi Pramitha, I am new to your place. You have very good collection of recipes. Nice event, will participate soon. I am happily following you and link in my recipe. Thank you. Hi Pramitha...i plan to take part too! :-)...also want you to know that i have a google community called "Online Food Blog Events"....would it be ok if i link this event on the community so that more people can get to know and take part?? Have linked the last two entries to simply tadka as well. Karunaikizangu fry and oats mango smoothie. Lovely event.. I have linked 10 entries... will try to add more. Gr8 event and happy to be a part of this. Linked my recipe too !!! Plz visit my blog in your spare time !!! sure i will visit your page..
Hi Pramitha.. Nice event, Happy hosting. Hi Pramitha, I am new to your blog and happily following you..I jave participated and linked my recipes for this event. Prami, added the images to all my link ups.. Sorry just saw ur message, it was sitting in my spam. Whenever you are ready for do wedding. Previous to any arrangement you must know about the visitor list.